Vetroflex Pet by animalife is a targeted supplement containing a completely natural proprietary peptide blend of hydrolysed collagen to support strong, flexible and healthy joints and bones. Vetroflex Pet has been scientifically formulated to help dogs and cats maintain supple movement and flexibility. Vetroflex Pet does not contain any NSAIDs and is safe to use on all dogs and cats. Supporting healthy cartilage in your pet’s joints, ligaments and tendons is fundamental to comfort and overall health, however wear and tear can occur at any age and active pets are particularly susceptible. Cartilage protects the animal’s joints and bones from friction caused by everyday movement. The articular cartilage forms a hard slippery coating on the end of each bone. It contains collagen and proteoglycans that interweave with the collagen to form a mesh-like tissue allowing cartilage to flex and absorb physical shock. Collagen is the most abundant protein in the body. It provides the structural matrix for bones, joints and connective tissue and is therefore an essential component of joint care, health and mobility. Vetroflex Pet has been scientifically formulated to create the optimum blend of amino acids to mimic the structural components of cartilage and stimulate collagen production by chondrocytes embedded in the extra-cellular matrix. 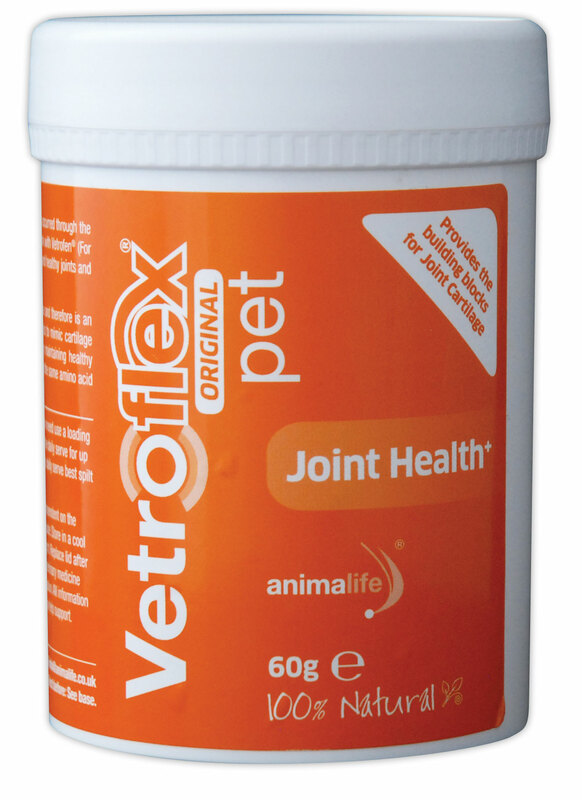 Vetroflex Pet is a pure peptide protein complex that has been scientifically formulated to ensure rapid and maximal absorption to enable your pet to strengthen and protect the joint. Vetroflex Pet works by protecting cartilage and synovial fluid against deterioration whilst stimulating the cartilage cells to promote more collagen and proteoglycans. Vetroflex Pet has the same amino acid composition as collagen and supplies the amino acids such as glycine and proline, of particular importance for the synthesis of collagen. Supports dogs and cats that are prone to stiffness. Represents a unique and proven approach to managing joint health. Pets generally show a response to Vetroflex in 2 to 4 weeks, while others may show a response in 6 to 8 weeks or longer. For fast results use a double serve of Vetroflex for up to 10 days. Where practical, the daily serve is best spilt into morning and evening servings.